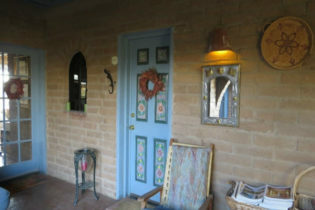 Come enjoy peace and quiet at the elegant Prescott Pines Inn B&B, just minutes from historic downtown Prescott, Arizona. We offer 13 charming guestrooms located in 4 guesthouses surrounding the main house, all with private baths and private porch entries. We also offer the Lodge, a 1,400-square foot cabin rental with 3 bedrooms and 2 baths, perfect for small groups, family reunions, and couples traveling together. 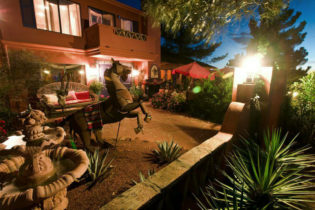 Make us your home base for exploring the Grand Canyon, Sedona, Flagstaff and Jerome! 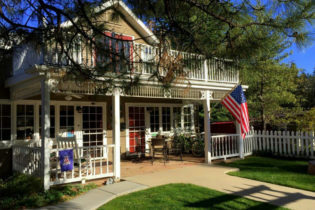 Just minutes from downtown Prescott, Arizona and historic Whiskey Row is the Prescott Pines Inn B&B, nestled at the edge of the Prescott National Forest. Enjoy a peaceful retreat in elegantly appointed guestrooms, on our patios and porches, or under the plethora of trees that surround the B&B. Prescott is ideally located at an elevation of 5,300 feet halfway between Phoenix and Flagstaff. Prescott’s rich history is alive in the buildings of famous Whiskey Row, the Courthouse Plaza, and the Sharlot Hall Museum. Guests can explore over 400 miles of hiking trails, 4 lakes offering fishing, kayaking, and sailing, 15 area parks, and 108 holes of golf! Several wineries are located within 30-45 minutes’ drive. The Grand Canyon, Sedona, Jerome, the Verde Canyon Railway, and the experimental urban design laboratory of Arcosanti are all within 1-2 hours of extraordinary scenic driving.